Packing has never been so easy and fast: it fits in the Car-Bags™ travel bag set, then it automatically fits into your trunk space. Most sets consist out of an under layer of handy trolley bags with wheels and telescoping handle and a top layer of matching hand bags. A Car-Bags travel bag set is exactly tailored per car model. The set is not composed of a fixed range of standard bags, but the sizes of the trolley bags and handbags are precisely adapted to the trunk space. As a result, the trunk space is optimally used in height, width and length. Exactly tailored per car model. All bags have a black inner lining with an extra layer of sturdy foam sheet, for maximum protection of the contents. All zipper sliders are equipped with metal eyelets, so that they can be locked with a small padlock. Each trolley is equipped with a practical telescoping handle and sturdy wheels with rubber tires. Each trolley has a handy zip pocket at the inner side. Each trolley has 2 or 3 lashing straps at the inside to keep the contents firmly in place. Each hand bag has convenient adjustable shoulder straps. With a Car-Bags travel bag set you make optimal use of the boot space and there will be less need to place less dangerous loose luggage in the passenger compartment of your car. 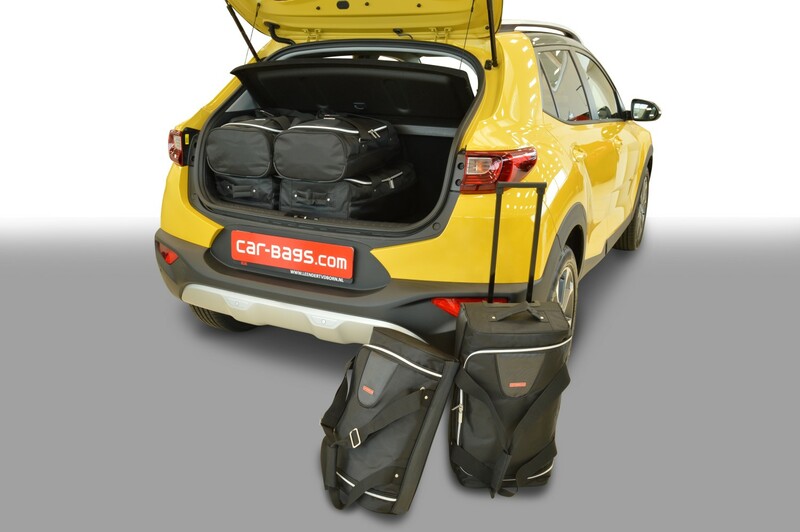 Each Car-Bags set is fully collapsible - unlike hard shell suitcases - and therefore easy to store in house. But also on your holiday destination, it is extremely handy if your empty bags use up as little space as possible. Car-Bags.com travel bags are mostly 30-35 cm wide, so that folded clothing fits well in it. Our bags are not too large, because large bags are heavy and difficult to handle. Moreover the contents of large bags tend to get tangled more easily. Thanks to the smooth surface dust and dirt cannot easily adhere and a wipe over with a damp cloth is often sufficient to make the bag look like new.